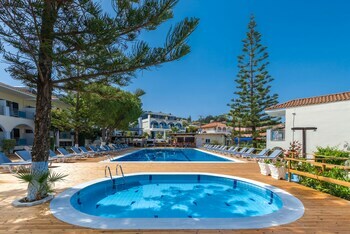 Located in Zakynthos, Contessa Hotel is near the airport, a 3-minute walk from Argassi Beach and within a 5-minute drive of National Marine Park of Zakynthos. Featured amenities include a 24-hour front desk and luggage storage. Free self parking is available onsite. When you stay at Mega Hotel in Corfu, you'll be on the beach and steps from Ipsos Beach. Featured amenities include a 24-hour front desk and coffee/tea in a common area. When you stay at Moireas Apartments in West Mani, you'll be on the beach and 7 minutes by car from Mikri Mantinia Beach. Free self parking is available onsite.